Flickr photo by U.S. Army Garrison – Miami, https://bit.ly/2DMszOE. In September, the Defense Advanced Research Projects Agency (DARPA) announced its plan to invest up to $2 billion over the next five years toward new programs advancing artificial intelligence (A.I.). DARPA describes the new investment as working toward what it calls the “third wave” of A.I. The “third wave” campaign is aimed at developing machines that can learn and adapt to changing environments. The DARPA investment is small by Pentagon spending standards, where the cost of buying and maintaining new F-35 warplanes is expected to exceed $1 trillion. But the spending is larger than A.I. programs that have historically been funded by the Department of Defense (DoD). The announcement marks the second major A.I. initiative in the last three months. In June 2018, the Pentagon announced the creation of the Joint Artificial Intelligence Center (JAIC). The JAIC serves as the primary hub for facilitating dozens of A.I. projects across the DoD. The DARPA funding is a parallel effort to the JAIC, which is expected to cost about $1.7 billion over the next five years. The JAIC is run through the DoD Chief Intelligence Officer’s (CIO) office and is expected to focus more on applications for artificial intelligence while DARPA initiatives will focus more on answering questions related to the science of A.I. DARPA is currently involved in more than 20 programs that are exploring ways to advance A.I. and the agency uses A.I. in more than 60 active programs, including cybersecurity, the detection of A.I.-created fake audio or video, and human-computer symbiosis programs targeting the interaction between people and machines. A.I. systems are complex and powerful with the ability to process unfathomable depths of information in a very short amount of time. Due to its capabilities, A.I. is increasing its prominence in Washington policymaking. The White House supported advancements in A.I. research in its annual research and development priorities memo on July 2018, which placed A.I. research as the federal government’s second-highest budget priority. The Pentagon has worked with more than 20 companies on Project Maven, but it hopes to expand initiatives like Project Maven and overcome reluctance among Silicon Valley workers. The DARPA funding also comes at the time of increasing caution over China’s national A.I. strategy. The Chinese government has invested heavily in multi-year technological campaigns aimed at supercharging a domestic A.I. market. With plans to build a $1 trillion A.I. industry by 2030, China is on the path to overtake the United States as the world’s leader in technology. Chinese tech giants, such as Alibaba and Baidu, work closely with the government on A.I. that could have applications for autonomous vehicles, health care, and national security. China has also been open about working closely with its own military on A.I. projects, with the goal of creating its own version of DARPA. From a military perspective, China is using A.I. to develop a range of unmanned aerial, ground, and underwater vehicles that are becoming increasingly autonomous. 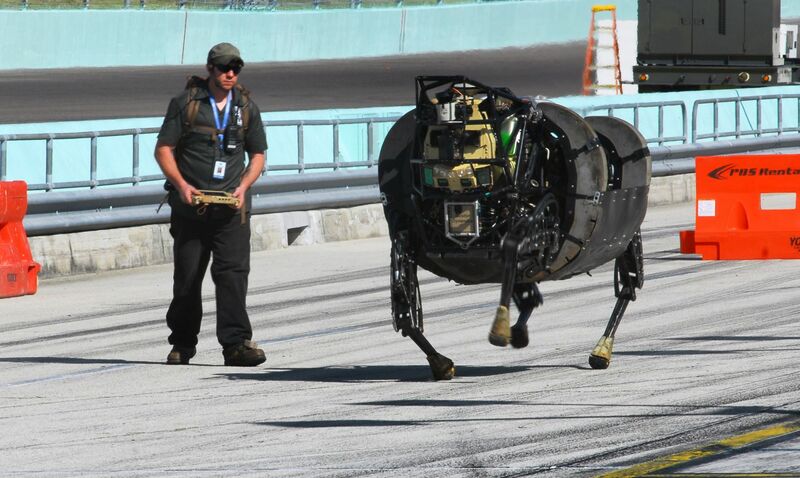 The DARPA funding is the first indication that the United States is addressing advanced A.I. technology with the scale and funding that the issue demands. With the serious implications that A.I. can bring to the realm of business and national security, it is necessary to have an open debate about A.I. and hear arguments from both sides. GLTR Staff Member; Georgetown Law, J.D. expected 2020; Smith College, B.A. 2013. ©2018, Aileen Kim.